Look… pixies! But with a 94.90% payout rate you’ll need to be patient to catch them in this Pixies of the Forest mobile slot. The good news? Their generous fairy gold won’t disappear in the morning. Don’t let the pretty theme fool you – this IGT slot is not for the faint of heart. With 99 paylines and 5 reels, this video slot is for the serious gambler who wants entertainment with a side helping of possible big wins. 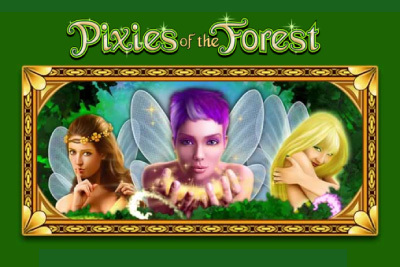 Pixies of the Forest slot game is not the hardest hitting IGT game, but it is harder to please than other with cascading reels, such as the Gonzo slot or Betsoft’s Rook’s Revenge. A step up, you won’t find wins a minute, but that’s because of the secrets these pixies hide. As if you are willing to learn the trick behind these pixies, this is easily one of the best IGT slots on the market. One, the theme and graphics are wonderful. Whether it’s the temptress pretty pixies on the reels that catch your eye, or the gorgeous forest glade background or even the pixie laughter tingling in the background from time to time, this mobile slot game makes it impossible not to smile back. And if you think the theme is a little too fantastical for your taste, we would recommend you have another look. Why? The tumbling reels. Pixies of the Forest slot machine is one of the few IGT games with tumbling reels. This feature is better than free spins in our books as it allows for bigger wins as winning symbols disappear and are replaced by new symbols – all at no extra cost to the player. Add a decent maximum win, a free spins bonus feature that is 4 times as rich as the main game and some great video disappearing graphics that never stop being exciting, and you’ll find yourself lost in the woods and unwilling to come home. Tumbling Reels: All winning symbol combinations disappear from the reels causing replacement symbols to come cascading down from above. Potentially you could have several tumbles creating a long streak of wins, although most tended to end at 1 or 2. Free Spins Bonus: Boy is this feature one to hope for. Four times as rich as the main bonus game, we practically got a win on every spin. Add to that tumbling reels, and you might think you only got 10 free spins, but it will feel like double that. You'll get a choice of five fairy jewels, giving you anything between 5 to 11 free spins. Pick and watch that gold head straight for your pocket. Wild Symbol: The wild symbol is your main friend in this game, creating those tumbling reels we know and love. In the main game this symbol appears only on reel 2, 3 and 4, but on free spins mode, you'll find it across all reels creating big wins. We love to play slots on mobile and this one most of all. It takes patience, and it certainly won't be paying out every other minute like other games with tumbling features, but that's the point of this mobile slot. It won't make you a millionaire, but you still have a chance of walking away with a decent size jackpot. And with beautiful graphics, great game play and some wonderful features we recommend you play Pixies of the Forest mobile slot to gather more than just a little pixie dust.